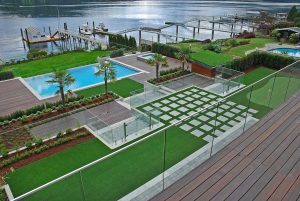 Stunning view of a custom landscaping project on a lake - Curb Design Inc. This custom landscaping project included artificial grass called precision greens, a stunning pool in the far back, custom ceder deck work and glass railing. This specific clients landscape is located right next to a large lake.